Remember to get your CECs completed by the end of the year with many great new workshops or take a course! gone onto this next level…Maybe its time! There are so many great new workshops and courses-don’t wait until the last minute this year to sign up. Stay inspired by expanding your knowledge. How did you find out about Pilates? My yoga teacher, Jean Hindle, introduced my wife to Melissa Kerber, and the rest is history. 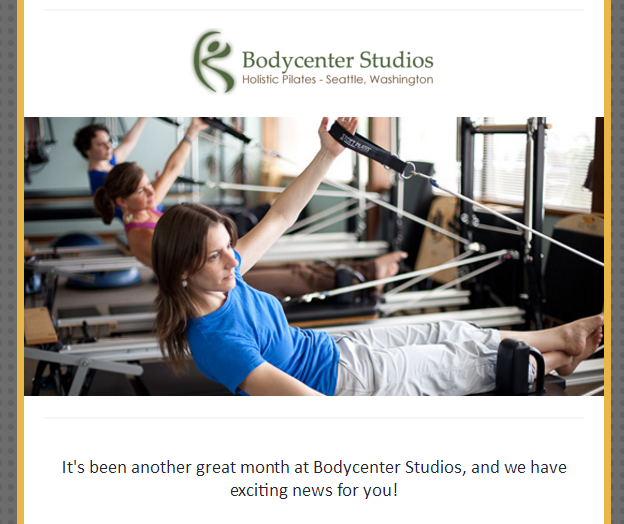 Can you describe how Pilates helped your individual situation, injury, or overall fitness goals? Pilates has been a great help to me. I am frequently injured and need to recover strength or movement that I’ve lost – Pilates is perfect for that. I often have a peculiar situation where I can’t do one of the exercises because of some recent injury – Pilates has so many exercise and so many modalities that we have never run out of alternative exercises to try. What is your favorite exercise, favorite piece of equipment, or favorite thing about Pilates? I like that Pilates has a big focus on the quality of a movement instead of restricting itself to the speed, strength, or number of repetitions of an exercise. Do you have any advice for people that may be in a similar situation and are interested in doing Pilates? I’d encourage anyone to engage with Pilates as a way back to activity or as a way to maintain and even increase physical activity levels. I’d recommend private sessions if possible when someone’s starting so they can get it right from the start.